Loquats are called Chinese plums, Japanese plums, Nisperos, and Misperos. Appropriately enough Chinese plums are from China but naturalized in Japan over 1,000 years ago. Loquats are in India, Hawaii, Pakistan, the Mediterranean area, and many other places. The trees thrive in warm areas since they bloom in winter and will freeze with hard freezes. Everywhere one goes here in South Texas one can see yellow and orange fruit hanging from a large leafed small tree. Nearly every neighborhood has some. One can find them in parking lots, parks, and roadways. The reason they are so commonly planted is that they are easy to start from seeds. They are not very easy to start from cuttings so every tree has fruit unlike its neighboring tree. The loquat trees in my yard were started from seeds just strewn over the bare ground, not even planted. Deep South Texas had the fruit ripe several weeks before central Texas. Since we had only mild frost this year it appears we are having a wonderful year. 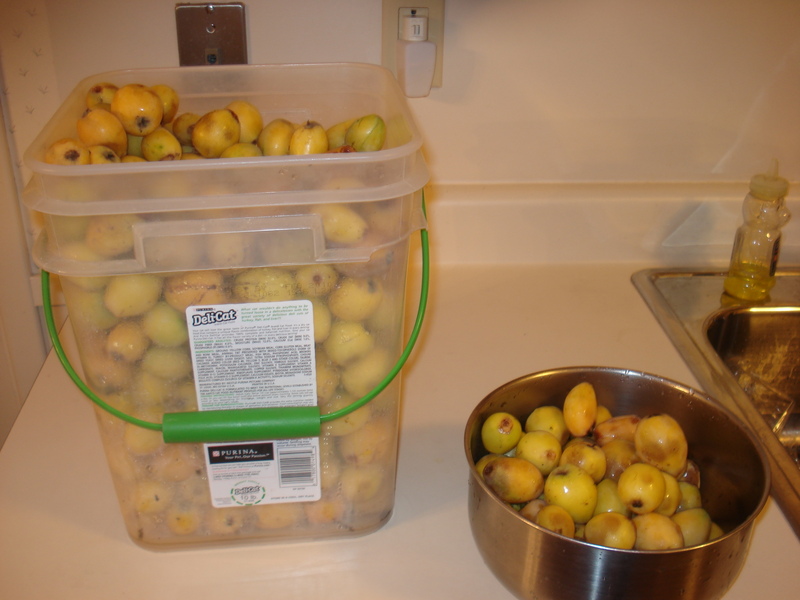 It did not take long to gather 5 gallons of the fruit. The trees that were harvested don’t even look like they were picked they were so full of fruit. All of my neighbors and friends offered me their fruit since they do very little with the fruit. However, it should be utilized much more than it is because it can be used in many different ways. It can be made into jelly, jam, syrup, wine, sauce, pies, cobbler, spiced loquats, compote, salsa, pickled, juiced, and of course eaten raw. To eat them raw they should be orange to get the sweetest flavor. However, they will still be tart. For jelly one can pick them yellow since this is the stage at which the natural pectin is present. Since pectin is used in my recipes I used both yellow and orange fruit. For wine one wants to have them as ripe as possible so the orange ones were picked for that purpose. It takes 9-12 cups of fruit to make 4 cups of liquid. 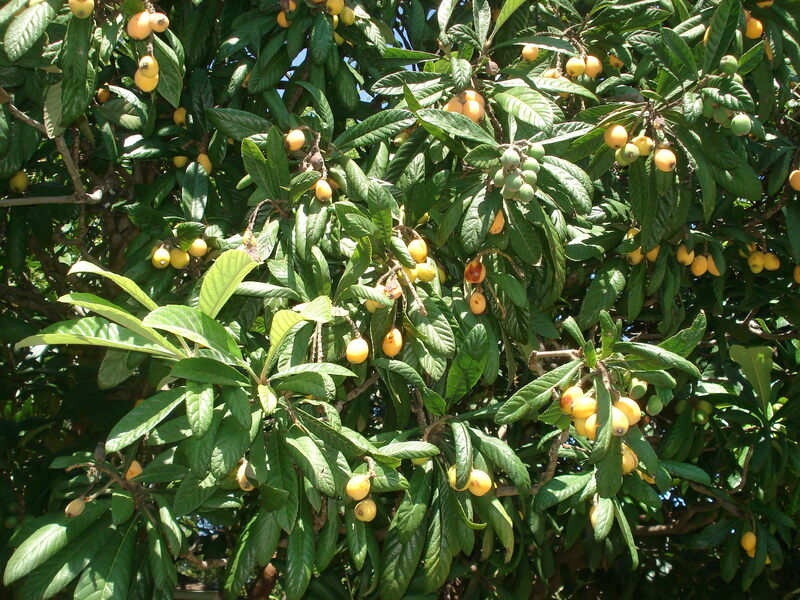 One of the beauties of the loquat is that they are large, easy to pick, and do not have thorns or prickles. However, each fruit has from 1 to 7 large seeds so they must be removed. Additionally there is a flower end that must be cut off too. Pretty quickly one gets into a rhythm where one slices the flower end and continues to cut the fruit in half and then pop the seeds out. Even so it takes a while to remove all those seeds. The fruit was placed into the pot and then covered with water. They were cooked for 15 minutes. They were then poured into a Foley food mill. Under that was placed a sieve. The sieve caught all the pulp. Sugar and cinnamon was added to the pulp. It made a wonderful sauce similar to apple sauce. The juice that had poured through the sieve was then used to make the jelly. The juice, lemon juice, and pectin are boiled until full rolling boil is achieved. Then sugar is added and after a full minute of rolling boil your jelly is ready to be poured into freezer containers. If jam is preferred then put the pulp into the juice. This is a fruit and jelly that should be utilized and appreciated much more than it is. Stir in the sugar and cinnamon to the pulp. Heat on the stove until ingredients are mixed. You can eat this like apple sauce as part of a meal or as a dessert. Fruit empanadas are a delicious treat. They are a fruit filling in the middle of pie dough. They are so easy to make and taste so wonderful I thought I would try to make one using loquat sauce. I bought already made pie dough and used a large drinking glass to cut out the circle shapes out of the flattened raw pie crust. I filled each circle with a small dab of the filling. I folded the circle in half, being careful to keep the filling from spilling out. I then used my fork to seal the edges. 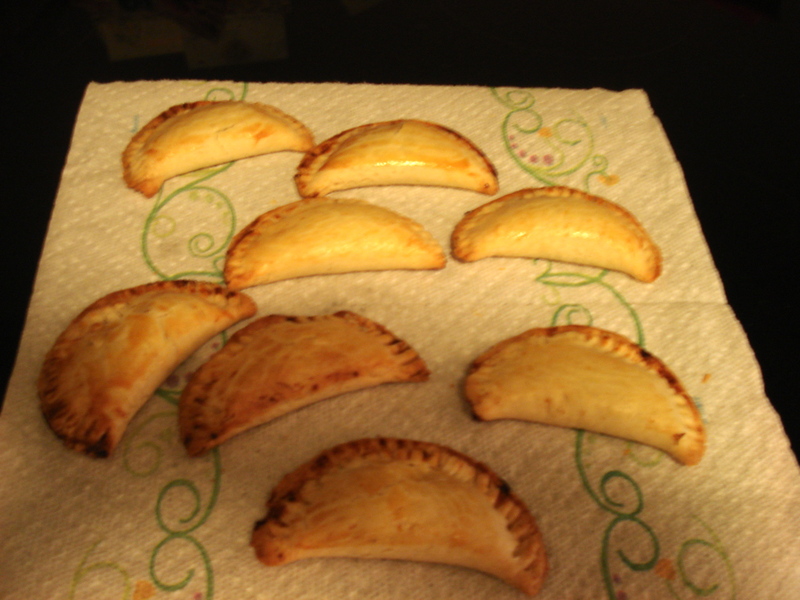 I brushed egg yolks on the tops of the empanadas. I put them on a cookie sheet in a 375 degree pre-heated oven. I baked them for 15 minutes until they were golden brown. I let them cool. Although they were still warm I had to try one. It was heavenly. Gallery | This entry was posted in Recipes and tagged Chinese plums, compota de misperos, compota de nisperos, Eriobotyra jamponica, jalea de misperos, jalea de nisperos, Japanese plums, loquat empanada recipe, loquat empanadas, loquat history, loquat jam, loquat jelly, loquat recipes, loquat sauce, loquat uses, misperos, nisperos, using loquats, When to pick Chinese plum, When to pick Japanese plums, When to pick loquats, Where to pick Chinese plums, Where to pick Japanese plums, Where to pick loquats, winter flowering fruit trees. Bookmark the permalink. I love your posts and wanted to tell you Roberta and I are planting a loquat tree in the back yard to replace that 4 grafted apple tree, which didn’t make it in last years drought. I was wondering, what do you think of the removal and replanting of that 15′ oak we have in the backyard, or otherwise, is the effort worth thinking about?? I am glad you enjoy the posts. A loquat is a good choice. The loquats in my yard survived the drought but dropped lots of leaves. The loquat tree will survive down to 10 degrees but the flowers freeze at 27 degrees. That is why the fruit did so well this year because we had a mild winter. The loquat tree can grow 20-25 feet tall with a 20 foot canopy. As far as the oak tree one has to think about what its final size will be and determine if your backyard will have sufficient space for that canopy. What type of oak tree is it? Where are you wanting to replant it? If you don’t want your tree to grow too tall or big, you can trim your loquart tree back each year. Thank you for the reciept. My husband and I are going to try to make some of the jelly. Will let you know how it turns out. I put up 15 pints of dewberry jelly this morning. To have some idea when they will be ready to pick, you might want to remember this. When you see the vines blooming, mark on your calender 28 days, then start checking the vines. They should be starting to get ready to pick 28 days from starting to bloom. loving deer hunter in TX. Mollie- Very useful tips. I particularly like your hint for determining the approximate date of fruiting. I went out picking dewberries again today. Never can have enough dewberries. Did you notice that the agarita bushes are now fully ripe? Although I admit that my freezer is once again full of fruit juices and jellies I hate to forgo harvesting fruits. I did harvest agarita berries in order to get the seeds for starting my own agarita “orchard”. Do let us know how the loquat jelly works out for you. Try the loquat empanadas. Delicious to say the least. Hello, I am originally from South Texas and LOVED these fruits! I am not in central MS and I want to grow them here so bad. Where can I find the seeds? Loquat fruit is damaged at 25 degrees and the plant is killed at 12 degrees. It does not fruit north of Jacksonville Florida. If you put it in a container and can protect it from the cold then perhaps you might get fruit. great I will look into it. It is really nostalgia for me. I think a lot of fruits and jellies are all about nostalgia. That is why people are so fond of dewberries, mayhaws, and the products made from them because they participated in the harvest and eating of those fruits when they were younger. Yes, yes, yes…the Chines Plums and Peaches were abundant in my neighborhood. As children, we never had to go home for a snack as long as there was fruit on the trees and a neighbor’s hose was near by. My momma used to make peach brandy, you ever try that with Loquats? I have never made peach brandy let alone with loquats. Though a Loquat/Peach jam sounds good. oooh peach/loquat jam sound amazing! I must look around your blog more. I want to start making preserves with my little one soon. Thanks for keeping in touch! and bringing back memories! 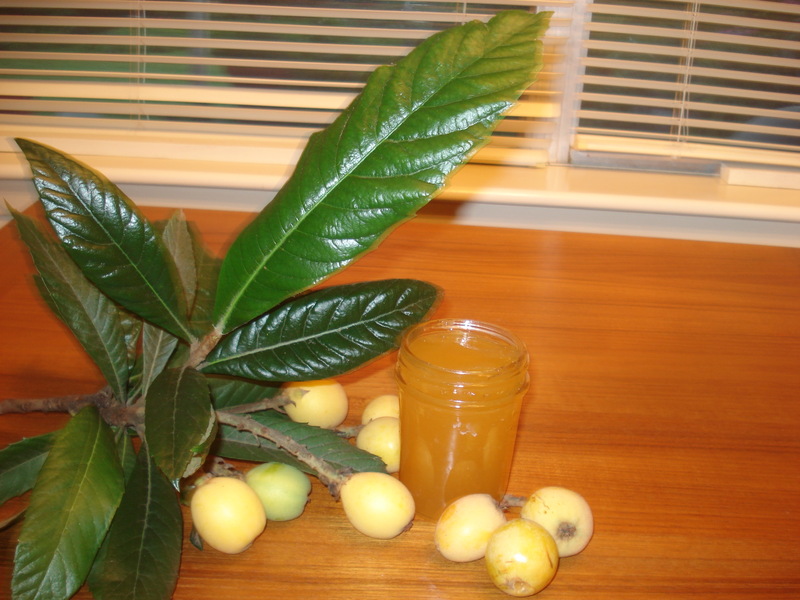 You can take the loquats and wash the fuzz off, cut off the blossom end and put the whole fruit in a mason jar and then add vodka to cover and let steep, the longer the better and it makes a wonderful loquat liquor plus the loquats are good to eat as well. I made some of the jelly year before last and it was fantastic. Now there is a fruit drink many people would like. You are right about the jelly being great too. Thanks for the information. Who knew? Theresa- Unfortunately I didn’t grow up here as a child so I don’t have any recollection such as this but I will ask some native San Antonians. Anyone else who wants to comment feel free to enter this discussion on salty dried loquats. I finally had some time to talk to friends who have lived in San Antonio all their lives. Chinese plum candy is actually made from a salted dehydrated plum (complete with seed) that came from China. It is not made from loquats (also called Chinese plums). It was the loquats you remembered peeling but the Chinese plum candy you remember was (and still is) imported from China. I note that there appears to be a recall on the Chinese plum candy from China due to lead in the product. Hello Theresa, I am from south Texas about 2.5 hours from San Antonia and I grew up eating these. There were on every corner in my old neighborhood. As children, we did not even peal them skin off. We would wash the outside of the fruit off (courtesy of the nearest water hose). The we would stick the whole fruit in our mouths, sometimes two or three at a time, and smash it with our tongues (kind of like eating a grape). The fruit (meat), juice, and seeds would skirt out of the skin. Then we would spit the seeds and skin out last. The fruit was never naturally salty, only sour (if not ripe) and wonderfully sweet when it turned orangish-yellow. I am now a little further north, trying to build a green house just to taste these nostalgic fruits once more. That might have been true…but I cannot assure you it is no longer the case. My dog eats herself sick from all the loquats that fall from our tree in Charleston, SC. Now if I can only figure out how to stop a woodpecker from attacking the tree!